Peggy Webb, author of 70 novels and 2 screenplays, lives in a cottage in Mississippi surrounded by gardens she designed and planted. A musician and actress as well as writer, she sings in her church choir and has sung in musicals at Tupelo Community Theater as well as played dramatic roles in Steel Magnolias and The Lion, the Witch and the Wardrobe.She started her career in 1985 with a romantic comedy that took the number one spot on romance bestseller lists. Romantic Times presented her with the prestigious Pioneer Award in recognition for her contribution to romantic comedy. Peggy is currently bringing the best of her romantic comedies back to fans as eBooks. In 2008 she turned her talents to mystery with the hilarious Southern Cousins series starring Elvis, the sleuthing basset hound who thinks he’s the King reincarnated. This multi-talented author also pens literary fiction as Anna Michaels and Elaine Hussey. 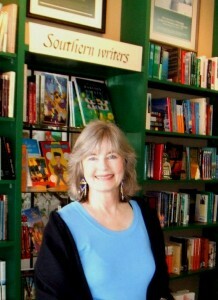 Pat Conroy calls her literary work “astonishing” and former Disney exec Kathie Fong Yoneda calls it “brilliant.” The author composed the blues lyrics that appear throughout her literary novel, The Sweetest Hallelujah, Elaine Hussey, due in bookstores July 30, 2013.